HashGenerator is the FREE universal hash generator tool which automates the generation of 14 different type of hashes or checksums. HashGenerator support most of the popular hashes including MD5 family, SHA family, BASE64, CRC32, ROT13, RIPEMD, ALDER32, HAVAL, WHIRLPOOL etc. HashGenerator can even generate hash for the file as well as text input also. 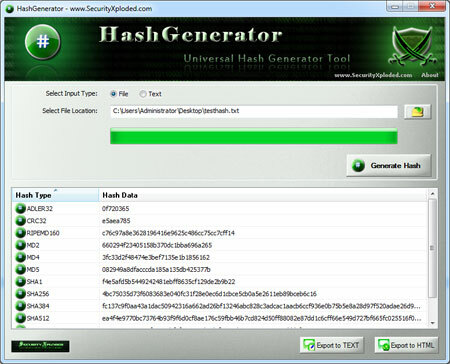 HashGenerator is the FREE universal hash generator tool. * Generate hashes for 14 popular algorithms including MD5, SHA256, BASE64. * 'Drag & Drop' feature to quickly drag files onto the tool. * Right click option to selectively copy the hash from the displayed list. * Simple, Easy to Use GUI Interface. Qweas is providing links to HashGenerator 1.0 as a courtesy, and makes no representations regarding HashGenerator or any other applications or any information related thereto. Any questions, complaints or claims regarding this application HashGenerator 1.0 must be directed to the appropriate software vendor. You may click the publisher link of HashGenerator on the top of this page to get more details about the vendor.